The Freedonia Group, a division of MarketResearch.com, invites you to access our new webinar free of charge. The security market, which includes both services and equipment, develops where the population believes that the capacity of local public safety officials is stressed and cannot adequately protect their interests. These regions and cities must have developed enough economically to have both the need and the ability to pay for supplemental security measures. According to Jennifer Mapes-Christ, Manager, Consumer & Commercial Goods, "Demand is buoyed by economic expansions, rising urbanization, and higher personal incomes." 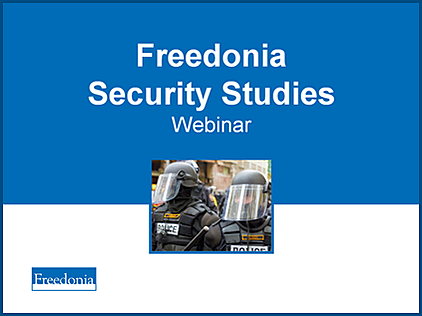 Freedonia’s security industry studies discuss the dynamics of regulations—changes in minimum wage, training requirements, and background check regulations—and trends in real and perceived crime rates. The studies further examine the interplay between security services and technological innovations in security equipment, as these segments are both complementary and competitive. World editions also identify varying opportunities for security firms in developed and developing markets.